This is the first of its kind to come out of my shop and of a type that I have been looking at since the glory days of drooling over "The Medieval Soldier" and loving the kit I saw there. It won't be the last. The Degen was a standard Swiss/German side arm and is heavily associated with Landsknechts, which seems to be a theme of mine of late. 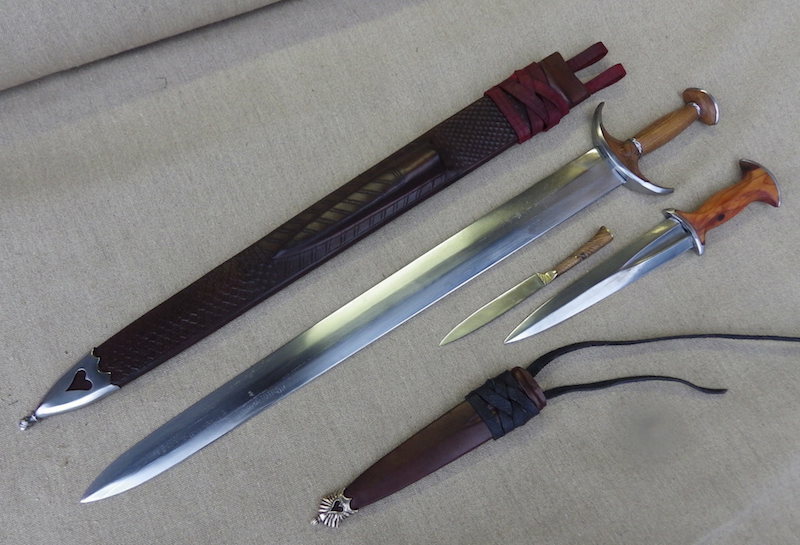 They came in a variety of sizes, but were often very much short swords and this of of that type. 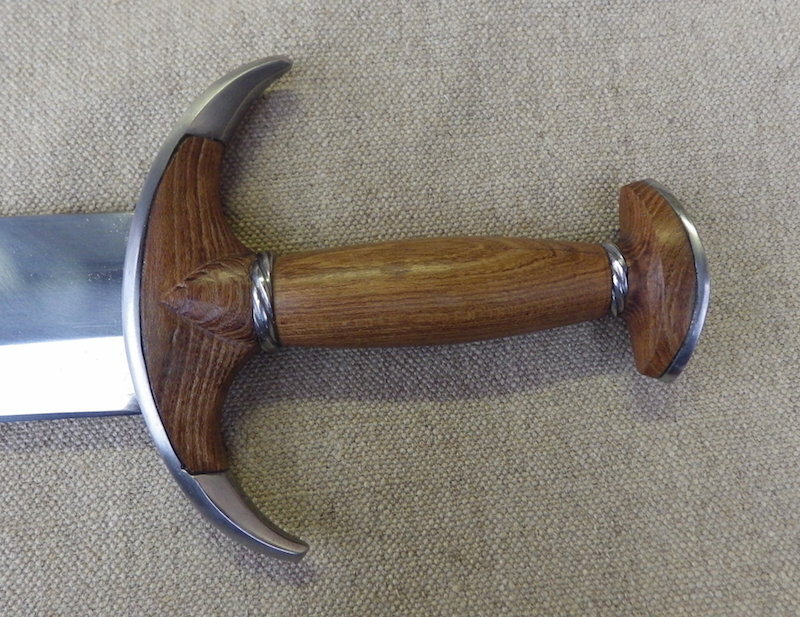 The sword has a stout 60cm blade with a hexagonal section and a classic if delicately done upturned guard in steel. 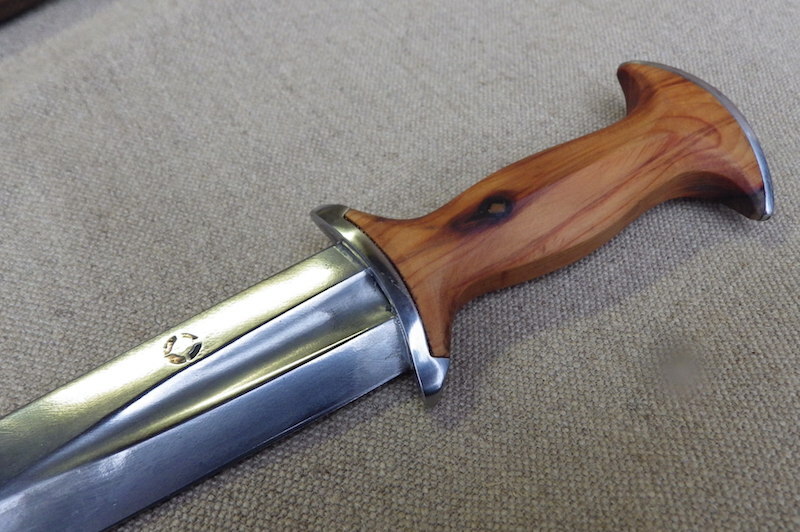 The handle is made in three pieces of laburnum with steel spacers. The top guard is also made in steel with bronze decorative retaining rivets. 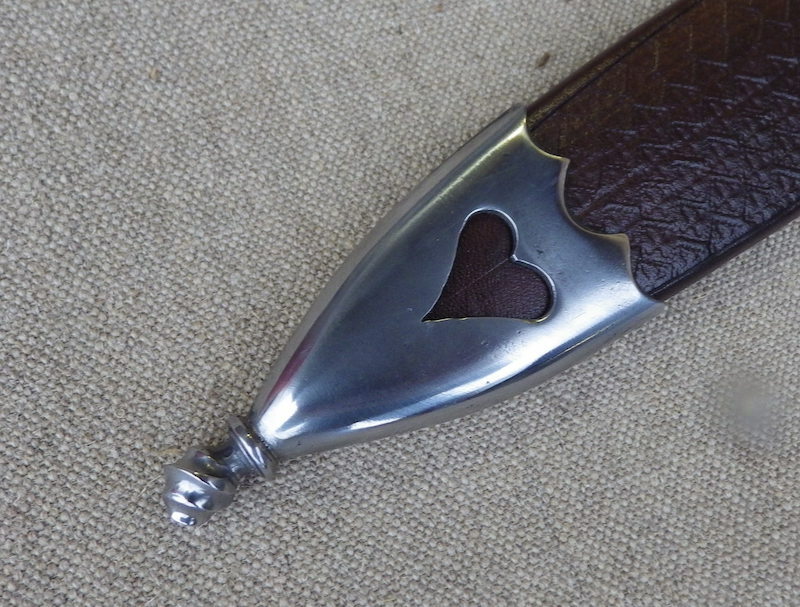 The baselard is quite short at around 18cm with a broad and thick blade in a diamond section with a prominent fuller each side and a makers mark inlaid in copper. At the hilt the blade is 8mm thick which combined with the wide fuller makes for a very strong blade indeed. 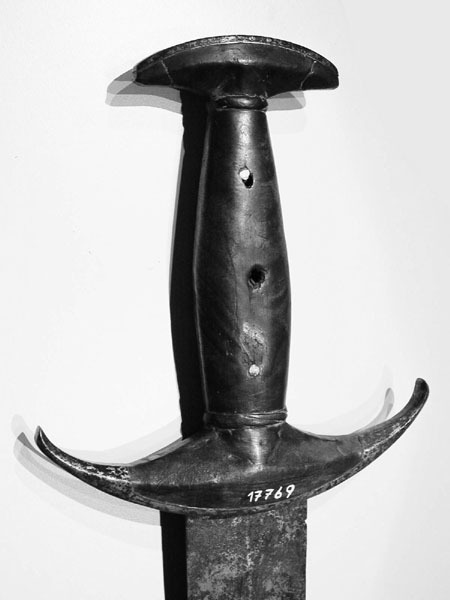 The grip is linseed oiled yew and and the guard and pommel are steel with the same decorative bronze retaining rivets. The sheath is made from two layers of veg tan leather with a woven suspension and a bronze chape. I hope you like them and of course any questions or comments please fire away. That's absolutely fantastic. I've seen the photo of the original degen for many years but honestly never noticed that the guard ends was made of metal and not of wood with a metal plate like so many others. This is a really cool detail and now that you've made it I can clearly on the antique.tique. It makes sense that those ends would not simply be wood, as they would much too thin and not durable enough for their intended purpose. 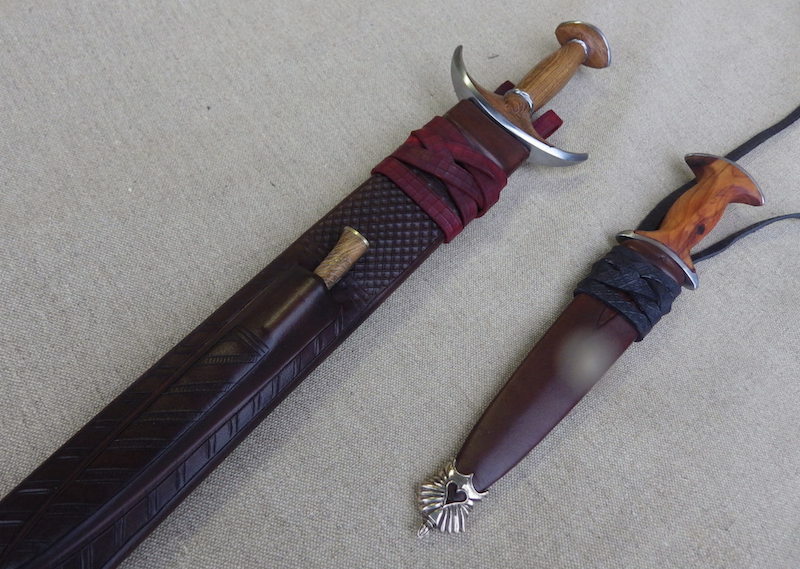 The scabbard, too... is stunning. Wonderful work as always! 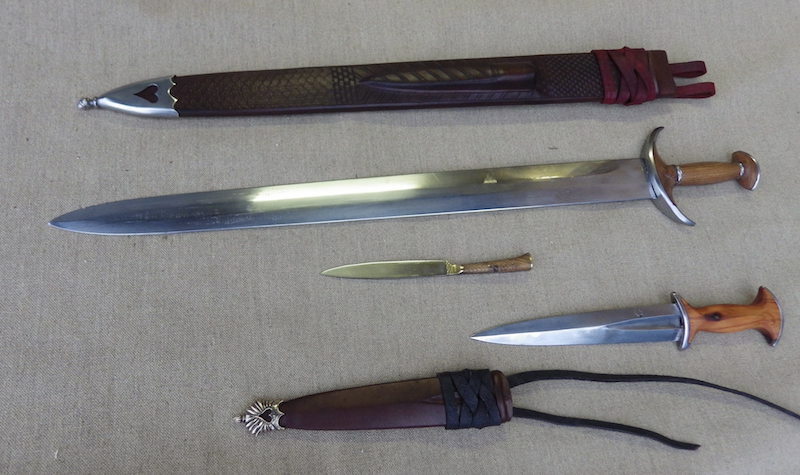 I have a short, slender hexagonal blade that I can't imagine as anything other than a schweizerdegen, but had not seen a hex section on one of these weapons until yours. It looks great! I'm curious, how were degens held and used? The quillons you could bind with them, buy they tilted downward , meaning blades would slide instead of catch. Also seems it would hurt your wrists if held to choose to the guard. The pommel look flat so I image you hold fairly far down and use chopping and casting moves for it, by the blade doesn't suggest a dedicated chopper. Was it is perhaps griped so the quillons were side ways? Maybe I'm hallucinating, but do I see a seam on top of the right guard terminal of the original shown above, suggesting that those were made by rolling over the guard plate? I have always assumed that those thick terminals are solid. The prospect of having to forge or file the center of the thick guard to create those terminals has always put me off that project. Now I'm wondering if at least some of them are created by rolling. May I ask, how old the original piece is? I instantly thought on this fresc from the 14th century. Such a great set. I love all parts of it, the guard shape, the woods used, the braiding on the scabbards, the chapes, the blades, just fantastic work!